Well wouldn’t you know it, this show aired in the US in 2002 but if my memory serves me correctly, it only appeared on our Channel Ten about one or two years ago. 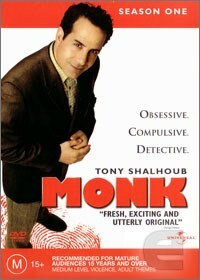 The quirky detective Monk (Tony Shalhoub) adds comic relief to his crime-solving repertoire by way of his obsessive compulsive disorder. Filmed on location in San Francisco, this detective notices things others do not—which makes him highly sought after. But his various little ‘knacks’ make him endearing to the audience and pretty bloody annoying to his on-screen colleagues—which only makes for fantastic TV. That being said, if you’re not a fan of ‘Woody Allen’-type characters, you’d better stay away from this one. I mean sure the crimes are interesting and their solving even more so, but the bottom line is Monk is Monk and if you don’t like (to quote one of its taglines) “Obsessive. Compulsive. Detective.” you’d better keep walking. So my brief conclusion is that this is definitely not one for everybody. In conclusion, Monk Season 1 is definitely entertaining but only if it’s your kind of thing. Truly a ‘try before you buy’ situation.